Instructor Biography: George Nicol, Ph.D., has been dancing Argentine Tango and Salsa for over 15 years and other dance forms including swing and ballroom since his early teen-age years. In college his dance focus was jazz dance where he also taught a jazz dance class. His teaching focus for the last 10 years has been Argentine Tango, Salsa and Swing. 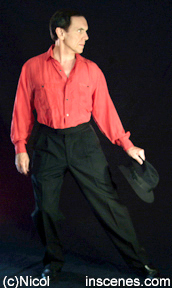 George currently teaches private lessons and classes in Tango, Salsa, and Swing in Palo Alto, CA, and Portland, OR. Dance History: George's Argentine Tango dance history includes lessons with the following master instructors and performers from Argentina: Carlos Gavito, Fabian Salas, Daniel Lapadula, Agustine & Claudio, Nestor Ray, Gustavo Naveira, Osvaldo y Lorena, Carlos y Alicia, Facundo y Kelly, Julio y Corina, Giselle Anne, Graciela Gonzalez, Nito y Elba, Roberto y Guillermina, Omar Vega, Tete y Silvia, and Pupy Castello. George has had modern and jazz master dance classes and workshops with dance company's such as the Alvin Ailey Dance Company, Martha Graham Dance Company, Dance Theatre of Harlem, and Alwin Nicholai Dance Company. George has also performed in the Portland Metropolitan Opera including dancing roles in "Die Meistersinger von Nurnberg", "Der Rosenkavalier", and "La Cenerentola". Additional dance experience includes Salsa lessons with Ron Montez, International Latin Champion, and Alex de Silva, choreographer for "So You Think You Can Dance"; Ballroom lessons at Louthan's Dance Studio, and the Star Light Dance Studio. George also studied Jazz Dance at Portland State University and he taught Jazz Dance at Mount Hood College. In addition,	George has experience in Boxing, Wrestling, and Karate from his College and Marine Corps days. George also loves sailing, scuba diving, skiing, ice skating, photography, and film making. George has danced Tango, Salsa, and Swing in many cities around the world including: Buenos Aires, Argentina, New York, Los Angeles, Miami, Las Vegas, Detroit, Portland, Waikiki, Vancouver, B.C., Bogota (Colombia), San Jose (Costa Rica), Paris, Nice, Rome, Florence, Borgeo, Genoa, Turin, and Venice. George also conducts dance tours to Buenos Aires, Italy, and the British Virgin Islands (BVI). Each private lesson consists of warm-up exercises, dance fundamentals, review, new steps, and dance practice. You can also request a specific technique or step you wish to learn. Dance home-exercise suggestions are made based on the needs of each student. There are limited slots for private and semi-private lessons, so sign up soon! Five Lessons: $80 per lesson. Three Lessons: $85 per lesson. Five Lessons: $105 per lesson. Three Lessons: $115 per lesson. If you like to have George and his partner do a dance performance for your special party or event or if you would like to perform with George for your event. Let George accompany you to a dance club for an evening of solid dancing. Dance with a pro. Dance Hosting Rate: $200 for 3 hours of dancing. Tour to Argentina, Italy, and the British Virgin Islands with George who conducts exclusive dance tours on a regular basis to Buenos Aire, Italy and BVI. Contact him if you would like to accompany him on one of his private tours. Let George, a film maker and photographer cna make you a dance video or take a professional dance photo of you and/or your partner. Get beautiful prints of you and/or your partner in dance poses. Great for your own portfolio or for gifts, your web site, or just for fun. Contact George for details. Learn an Argentine Tango Dance Performance for your Wedding or Party! Contact George for details. 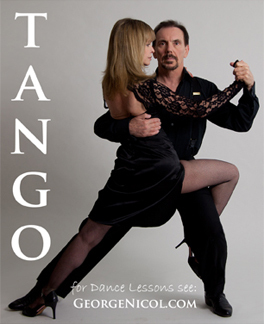 Occasionally, George teaches classes in Argentine Tango, Swing, Salsa and other Latin dances in Palo Alto.